Using this limited resource smartly has become the main priority for all aircraft operators around the globe. That’s why most of them have already set up a fuel efficiency program while the others are, or should be, planning to do so. How to compose a fuel team? There are many stakeholders when it comes to fuel management: dispatchers choose how much fuel will be needed for the flight, but pilots are able to add some discretionary fuel and are the ones actually using it. Finance negotiates prices on the fuel tender and Engineering and Maintenance actions also affect fuel consumption. Pilot: Every fuel team should have a pilot! A lot of fuel saving initiatives must be applied during the flight and pilots know the constraints and procedures better than anyone. Dispatcher: An accurate and optimized flight plan is also key to achieve good fuel performance: that’s why having a dispatcher in the team is also crucial. Flight Operations Engineer: Full understanding of aircraft performance and technical notes is the basis of any fuel efficiency program. Data Analyst: Data from several sources must be merged and analyzed to know where we are and decide where we want to go. Data Analysts will use their magic tricks to transform millions of numbers into understandable graphs and dashboards. Flight Safety Analyst: You must ensure that all initiatives never compromise safety in any circumstance. That’s why a Flight Safety Analyst should be continuously engaged with the fuel team. Depending on the size of the airline, each of these positions can be represented by a part-time employee, a full-time one or even several people. 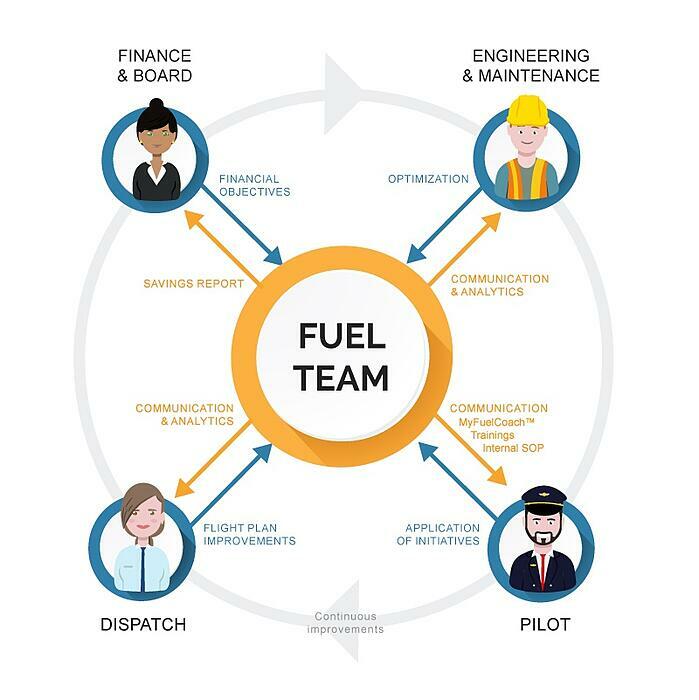 Keep in mind that an efficient loop between the fuel team and operations is vital to success. What tools does the team need? You probably know this famous quote from Lord Kelvin: “You cannot improve what you cannot measure.” Indeed, without a clear view on the fuel savings achievements, it might be difficult to keep your team engaged on this issue. 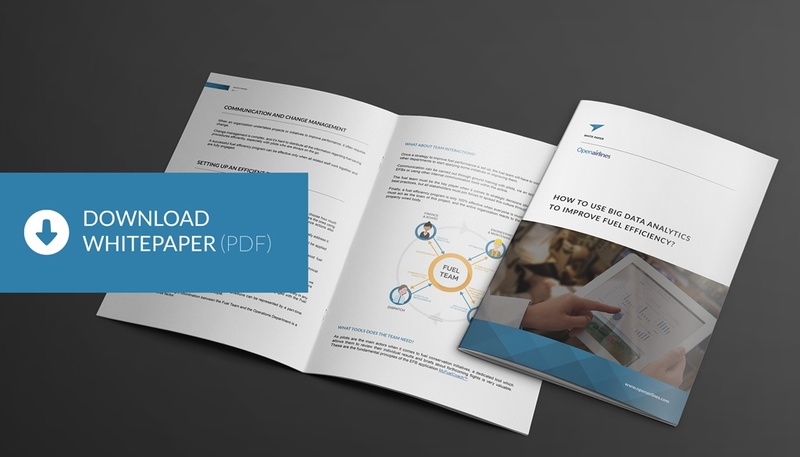 When setting up a fuel efficiency program, your ultimate goal is to transform the torrent of raw data that is captured from individual flights into actionable insights to optimize airline operations. 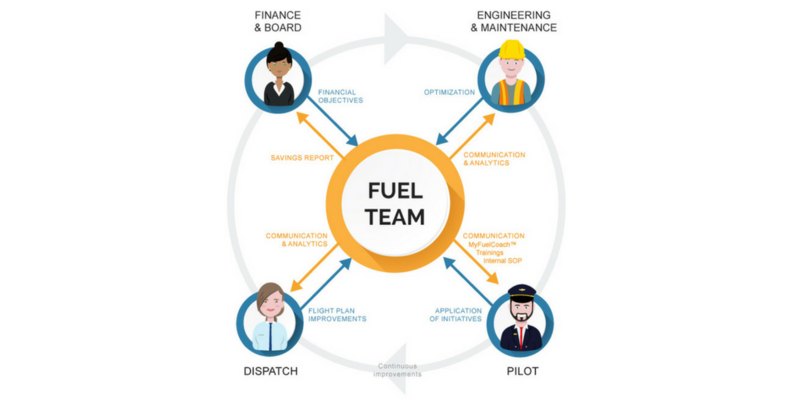 As pilots are the main actors when it comes to fuel conservation initiatives, a dedicated tool which allows them to review their individual results and briefs about forthcoming flights is very valuable. These are the fundamental principles of MyFuelCoach™: an EFB application that shows pilots their own results and briefs them about what to expect on upcoming flights. “Pilots are much more aware of their fuel performance and how they can improve. They feel engaged in the process." Once a strategy to improve fuel performance is set up, the fuel team will have to work together with other departments to start applying some initiatives or improving them. Communication can be carried out through ground trainings with pilots, via an application on their EFBs or using other internal communication tools within the airline. The fuel team must be the key player when it comes to strategic decisions about fuel efficiency best practices, but all stakeholders must join forces to spread this culture through all departments. Finally, a fuel Efficiency program is only 100% effective when everyone is involved. The fuel team must act as the brain of this project, and the entire organization reacts to the brain stimuli like a properly wired body.